Tile flooring in Jackson, TN, is a classic that complements every decorating style. For thousands of years, tile has been the flooring of choice for houses, as well as public buildings. To choose porcelain or ceramic floor tile for your building project or home remodel, count on The Floor Trader of Jackson. Our flooring store is a warehouse, well-stocked with brand-name tile in a varied assortment of types, colors, shapes, and sizes. You can find exactly what you need and take it with you that day. We run a cash-and-carry operation with truckloads of flooring delivered every week. Because we buy in quantity, we pay low prices on quality products and pass the savings along to you. You get great value for your flooring dollars at our outlet. Find budget prices on tile in our warehouse you won't find anywhere else. Even though our prices are low, our products are top quality. We only sell brand-name floor coverings from reputable manufacturers. Brands are important for they tell you manufacturers think highly enough of these flooring products to put their name on it. These same manufacturers spend time and money improving the performance of the products and enhancing the appeal with the freshest styles and colors. In our outlet, you'll find these trusted brands of tile. Shopping at our warehouse, you'll find a great variety of tile for your remodel. Share your vision for your project with one of our flooring experts. Our professional takes your requirements and preferences into account and shows you the possibilities of this flooring option. 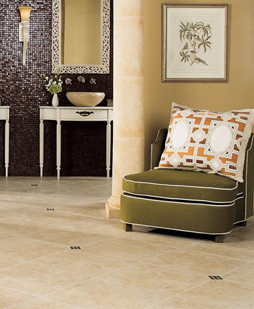 Let us help you choose tile that is attractive, affordable, and durable. Ceramic - This tile comes with an elegant appeal and the lowest price tag. Ceramic is kiln-fired clay that is strong, durable, and soft as far as tile goes. This makes it easy to install. Porcelain - Prized for its modern look, porcelain is made from fine clay and fired at higher temperatures than its sister tile ceramic. This results in contemporary beauty and a surface that can withstand heavy foot traffic. Stone - Quarried from the earth, stone tile carries a higher price tag than porcelain or ceramic. Stone tile is dense, heavy, and strikingly beautiful. One of our most popular selections is tile made from slate. As tile is a heavy flooring type, we recommend professional flooring installation. Let us share out list of preferred installers with you, so you can choose a contractor to lay that new tile flooring for you. Contact us today for help from our flooring experts in choosing the right tile for your building or remodeling project. We proudly serve homeowners, builders, contractors, and flooring installers from Jackson, Three Way, Spring Creek, White Fern, and Beech Bluff, Tennessee, and the surrounding areas.